A. N-Chlorosaccharin (2). A 500 mL round-bottomed, single-necked flask equipped with a Teflon-coated, oval magnetic stir bar is charged with saccharin (1) (18.0 g, 98.3 mmol, 1.0 equiv) (Note 2), followed by methanol (350 mL) (Note 3). The flask is equipped with a glass gas adapter and stirred under a nitrogen atmosphere (Figure 1A). Vigorous stirring (750 rpm) produces a turbid suspension. The adapter is removed temporarily and tert-butyl hypochlorite (13.9 g, 128 mmol, 1.3 equiv) (Note 2) is added in one portion to the suspension. 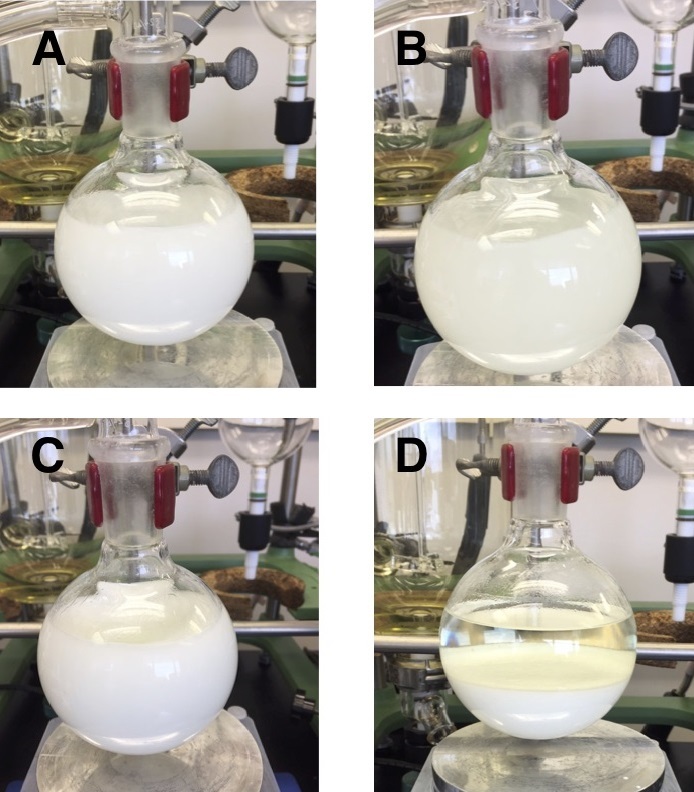 The suspension becomes a clear solution, after which a large amount of white precipitate is formed quickly (Figure 1, B and C). The mixture is stirred for 5 min and then allowed to stand without stirring for 5 min (Note 4) (Figure 1D). The precipitate is vacuum filtered using a 70 mm Büchner funnel with Whatman #1 filter paper (Note 5). The reaction flask and the cake are rinsed with petroleum ether (100 mL) (Notes 3 and 6). The solid is removed from the filter paper and is dried at ambient temperature under high vacuum (< 12 mmHg, 6 h) to afford N-chlorosaccharin (2) as a white powder (16.2-16.9 g, 76-79%) (Notes 7 and 8) (Figure 2). N-Chlorosaccharin (2) is stored in a refrigerator (4 °C) with the exclusion of moisture (Note 9). B. tris-Silver (I) trifluoromethanethiolate acetonitrile solvate (3). To an oven-dried 500 mL round-bottomed, single-necked flask equipped with a stir bar is added dry silver (I) fluoride (50 g, 394.1 mmol, 1 equiv) (Note 10). The flask is equipped with a gas inlet, and the system is evacuated and refilled with argon three times. The gas inlet is removed, dry acetonitrile (250 mL) (Note 3) is poured into the flask, and the flask is fitted with a reflux condenser equipped with a gas inlet (Note 11). While under a positive pressure of argon the joint between the flask and reflux condenser is separated, carbon disulfide (50 mL) added by syringe (Note 12) (Figure 3), and the reflux condenser is reattached. 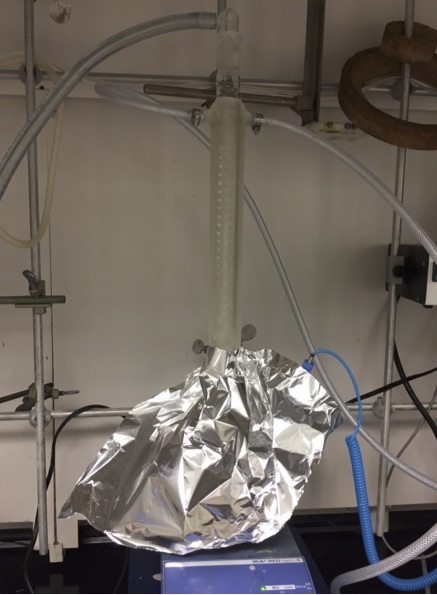 The flask is then placed into a preheated 80 °C oil bath with efficient stirring (Note 13) and protected from the light with aluminum foil (Figure 4). After 12 h the reaction mixture became a black mixture, at which time the flask is removed from the oil bath and the contents are allowed to cool to room temperature. The reflux condenser is replaced with a distillation head and excess carbon disulfide is removed by atmospheric pressure distillation at 75 °C for 1.5 h (Note 14) (Figure 5). The distillation head and magnetic stir bar are removed. 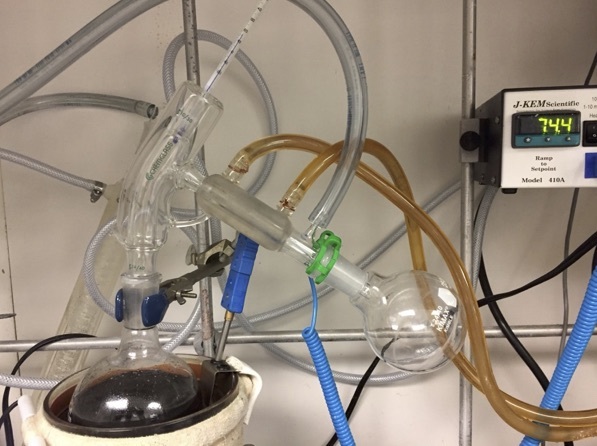 The flask is transferred to a rotary evaporator and the remaining solvent is removed at 40 °C by gradually reducing the vacuum level to 30 mmHg to yield a black residue. The residue is re-suspended in ethyl acetate (2 x 100 mL) (Notes 3 and 15) and filtered through a pad of Celite (40 g) (Note 16). The black residue on the top of the Celite cake is washed with ethyl acetate (2 x 100 mL) (Figure 6). 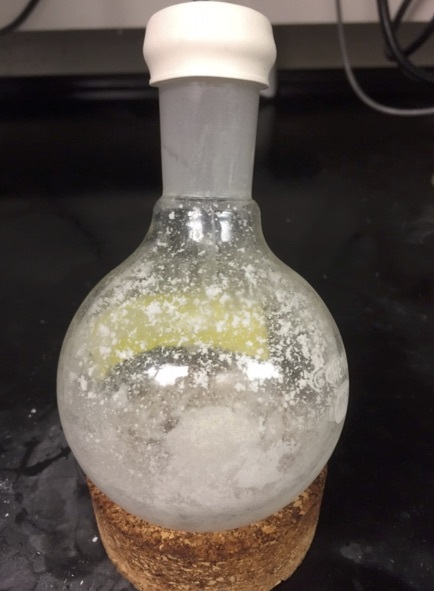 The flask is then wrapped in aluminum foil and the ethyl acetate is once again removed under reduced pressure with the aid of a rotary evaporator (40 °C, 30 mmHg) to yield a yellow oil with fine crystals suspended in it. The yellow material (Note 17) is dissolved in a minimum amount of acetonitrile (15 mL) (Notes 3 and 18) to produce a clear yellow solution. 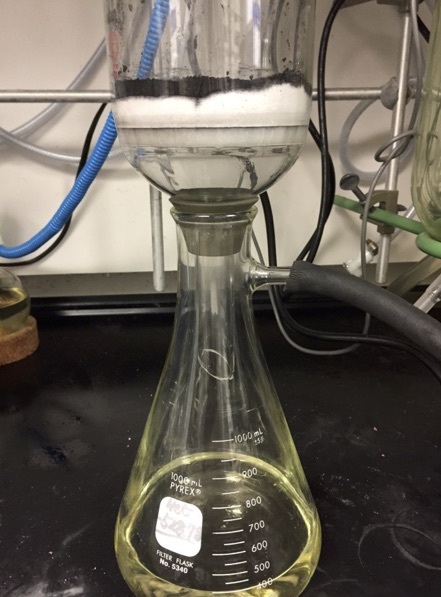 Approximately 350 mL of diethyl ether (Note 3) is carefully layered on top of the yellow solution, which becomes milky white during the addition. The flask is capped with a stopper and left at room temperature for 10 min after which it is placed in a freezer set to -20 °C for 24 h to produce an off-white or pale yellow solid. The flask is removed from the freezer and the mixture is vacuum filtered using 70 mm Büchner funnel with a Whatman #1 filter paper. A portion of mother liquor (~ 50 mL) is used to rinse the crystallization flask and transfer the remaining product to the filter. 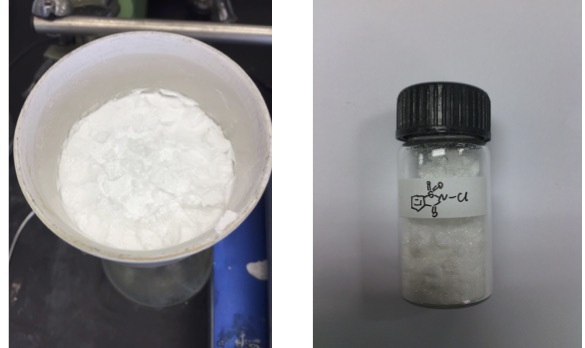 The residue is dried at ambient temperature under high vacuum (< 12 mmHg, 6 h) to afford tris-silver (I) trifluoromethanethiolate (3) as an off-white solid (21.5-26.9 g, 74-92%) (Notes 19 and 20) (Figure 7). The solid is stored in a refrigerator (4 °C) with the exclusion of light. C. N-Trifluoromethylthiosaccharin (4). 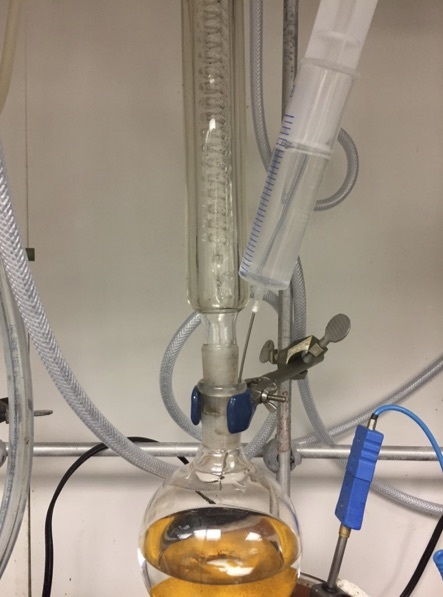 A 250 mL round-bottomed, single-necked flask equipped with a Teflon-coated, oval magnetic stir bar is charged with N-chlorosaccharin (2) (5.0 g, 23.0 mmol, 1 equiv) and tris-silver (I) trifluoromethanethiolate acetonitrile solvate (3) (6.0 g, 9.0 mmol, 0.4 equiv) followed by acetonitrile (65 mL) (Note 3). The flask is equipped with a gas inlet, and the reaction mixture stirred vigorously (Note 21) under an atmosphere of nitrogen at room temperature for 30 min. The white slurry changed to a fine light grey suspension over the reaction time. The solvent is then filtered through a pad of Celite (30 g) (Note 22) (Figure 8). The acetonitrile is evaporated under reduced pressure with the aid of a rotary evaporator (40 °C, 30 mmHg). 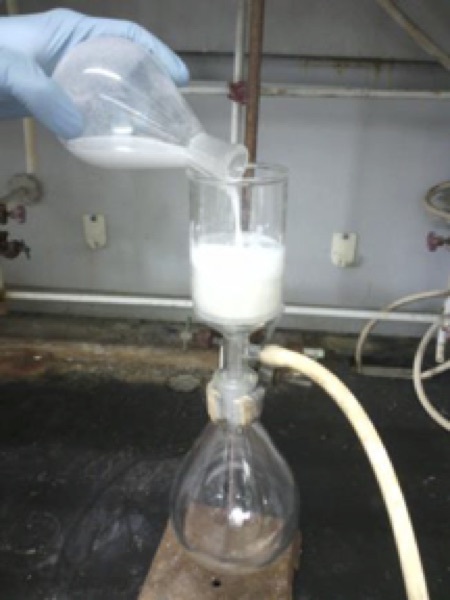 The residue is mixed with dichloromethane (90 mL) (Note 3 and 23) to provide a white suspension that is agitated on a rotary evaporator at 40 °C for 10 min to ensure dissolution of the product. The dichloromethane is filtered through a pad of Celite (Note 24) (30 g), and the flask is rinsed with dichloromethane (30 mL x 3), which is filtered through the Celite. If the filtrate is not clear, a second filtration through a pad of Celite is necessary (Note 25). The dichloromethane is evaporated under reduced pressure with the aid of a rotary evaporator (40 °C, 260 mmHg). The residue is further dried at ambient temperature under high vacuum (<12 mmHg, 6 h) to afford N-trifluoromethylthiosaccharin (4) as a white solid (4.0-5.0 g, 61-77%) (Notes 26 and 27) (Figure 9). The product is kept in a refrigerator (4 °C) with the exclusion of moisture. 1. Prior to performing each reaction, a thorough hazard analysis and risk assessment should be carried out with regard to each chemical substance and experimental operation on the scale planned and in the context of the laboratory where the procedures will be carried out. Guidelines for carrying out risk assessments and for analyzing the hazards associated with chemicals can be found in references such as Chapter 4 of "Prudent Practices in the Laboratory" (The National Academies Press, Washington, D.C., 2011; the full text can be accessed free of charge at https://www.nap.edu/catalog/12654/prudent-practices-in-the-laboratory-handling-and-management-of-chemical). See also "Identifying and Evaluating Hazards in Research Laboratories" (American Chemical Society, 2015) which is available via the associated website "Hazard Assessment in Research Laboratories" at https://www.acs.org/content/acs/en/about/governance/committees/chemicalsafety/hazard-assessment.html. In the case of this procedure, the risk assessment should include (but not necessarily be limited to) an evaluation of the potential hazards associated with saccharin, methanol, tert-butyl hypochlorite, petroleum ether, silver (I) fluoride, carbon disulfide, acetonitrile, ethyl acetate, celite, diethyl ether, dichloromethane, as well as the proper procedures for vacuum distillation. 2. Saccharin (98%) was purchased from Aladdin and used as received. The Checkers purchased saccharin (≥98%) from Aldrich and used it as received. tert-Butyl hypochlorite was prepared following an Organic Syntheses procedure2 that uses commercial bleach. 3. Methanol (HPLC grade, >99.9%), ethyl acetate (ACS reagent grade >99.5%), diethyl ether (ACS reagent grade, >99 stabilized with BHT), petroleum ether (bp = 60-80 °C, puriss), dichloromethane (ACS reagent grade > 99.5%) were purchased from Aldrich and used as received. Acetonitrile (Optima grade) were purchased from Fisher Chemical and used as received from a new bottle. Celite 545 was purchased from Fisher Chemical. 4. Vigorous stirring was used to ensure that the starting material was fully consumed. 5. The filter cake should be pressed with a spatula to remove most of the methanol. 6. Caution: The filtrates were treated with a 10 wt% aqueous solution of sodium thiosulfate to destroy any remaining tert-butyl hypochlorite, which was identified by testing with Quantofix peroxide test strips that had been pre-wetted with water. 7. A second crop (1.9g, 9%) can be isolated as a white solid from the filtrate by concentrating it to about half of the original volume. 8. N-Chlorosaccharin (2) exhibited the following characterization data: white powder, mp = 144 °C; 1H NMR pdf(500 MHz, CDCl3) δ: 7.91 (dd, J = 7.4, 7.4 Hz, 1H), 7.97 (m, 2H), 8.13 (d, J = 7.5 Hz, 1H); 13C NMR pdf(125 MHz, CDCl3) δ: 121.7, 125.8, 126.5, 134.9, 135.5, 137.8, 156.6. MS (EI) m/z (%): 183 (100), 217. HRMS: Calcd for C7H4ClNO3S: 216.9600; Found: 216.9594. Purity was assessed as 93% by quantitative 1H NMR pdf by using dimethyl fumarate as the internal standard. 9. The filtrates were treated with a 10 wt% aqueous solution of sodium thiosulfate to destroy any remaining tert-butyl hypochlorite by testing with Quantofix peroxide test strips which had been pre-wetted with water. 10. Silver (I) fluoride (99%) was purchased from Oakwood Products and used as received. Silver (I) fluoride was weighed quickly because it is sensitive to light and water. 11. A reflux condenser with a coil and jacket was used to keep the low boiling CS2 from escaping during the reaction. 12. Carbon disulfide (>99.9%) was purchased from Aldrich and used as received. Caution: Carbon disulfide has an auto-ignition temperature of 90 °C. Contact with a hot surface at 90 °C or higher will cause it to ignite. Care should be exercised in choosing the location and equipment for the experiment. 13. The initial three-phase system has a vigorous reflux and efficient stirring is important for the reaction. 14. The distillate came over as a mixture of acetonitrile and carbon disulfide. The carbon disulfide should be removed fully, since it is both smelly and toxic and has a pungent odor. 15. The flask should be agitated to ensure that tris-silver (I) trifluoromethanethiolate (3) is fully dissolved in the ethyl acetate, or the yield will be lower. A second filtration will be necessary if the black material is not removed through the pad of celite. 16. A 95 mm diameter glass funnel with a 25-50 µm frit was used, and a 90 mm Whatman #1 filter paper was placed on top of the celite to protect the cake. The celite was prewashed with EtOAc (150 mL), and the wash discarded. 17. The yellow product can range from a yellow solid to a viscous oil. 18. The flask should be heated in a 40 °C water bath to make sure that the product dissolves in acetonitrile. 19. The yield is dependent on washing the product out of the black silver sulfide residue. If the residue is concentrated under a strong vacuum, it can become a hard solid, and the yield is diminished due to less efficient extraction of the product. 20. The exact formula of the desired product is 3AgSCF3•CH3CN, which was unambiguously characterized by X-ray and elemental analysis.3 Off-white fibers, mp = 119.3; IR (Solid via ATIR): 1077 (s), 1033 (s), 931 (m), 752 (m) cm-1. 19F NMR pdf(470 MHz, d6-DMSO) δ: -18.7 Hz. Purity was assessed as >99% by quantitative 19F NMR pdf using 3,3'-bis(trifluoromethyl)benzophenone as the internal standard. 21. Stirring vigorously to make sure that the starting material was fully consumed. 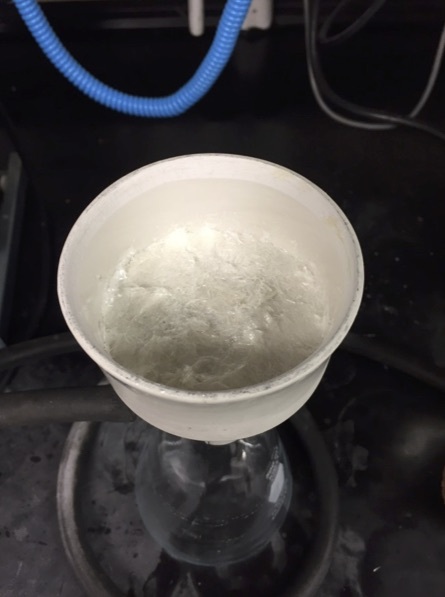 A small quantity of silver chloride suspended in the filtrate can be removed by filtration. 22. A 65 mm fritted glass funnel 10 - 16 µm was used, and a 60 mm disk of Whatman #1 filter paper was placed on top of the Celite to protect the cake. The cake was prewashed with acetonitrile (30 mL) and the wash discarded. 23. The suspension should be agitated to ensure that N-trifluoromethylthiosaccharin (4) is fully dissolved in dichloromethane, otherwise the yield will decrease. 24. A 65 mm fritted glass funnel 10 - 16 µm was used. A 60 mm disk of Whatman #1 filter paper was placed on top of the Celite to protect the cake. The cake was prewashed with dichloromethane (50 mL) and the wash discarded. 25. A small quantity of silver chloride could be suspended in the filtrate and will influence the quality of the product. If the filtrate was not clear, a second filtration is necessary. 26. N-Trifluoromethylthiosaccharin (4) exhibited the following characterization data: white solid, mp = 112.8 °C; 1H NMR pdf(500 MHz, CDCl3) δ: 7.94 (dd, J = 7.7, 7.5 Hz, 1H), 8.02 (m, 2H), 8.20 (d, J = 7.7 Hz, 1H). 19F NMR pdf(470.6 MHz, CDCl3) δ: -47.31 Hz; 13C NMR pdf(125 MHz, CDCl3) δ: 121.9, 126.1, 126.5, 128.5, 134.9, 136.3, 137.9, 158.3. Purity was assessed at 100% by quantitative 19F NMR pdf using trifluoromethylbenzene as an internal standard. In recent years, organofluorine chemistry has received much attention since fluorinated compounds are widely used in agricultural chemical, pharmaceuticals, and organic functional materials. The trifluoromethylthio group (CF3S-) is one of the most "sought-after" fluoroalkyl groups owing to its high lipophilicity (Hansch lipophilicity parameter π = 1.44)4 and strong electron-withdrawing properties that could improve the drug's pharmacokinetics and efficacy.5 Trifluoromethylthiolated compounds were classically prepared via a halogen-fluorine exchange transformation of the corresponding polyhalogenomethyl thioethers or a direct trifluoromethylation of sulfur-containing compounds.6 However, the harsh reaction conditions and/or limited substrate scope of these methods limited their widespread applications. Direct trifluoromethylthiolation of organic small molecules using an electrophilic trifluoromethylthiolating reagent7 would circumvent these limitations and provide an alternate straightforward strategy for incorporation of the trifluoromethylthio group into drug molecules at the late stage of drug development. To this end, our group developed an easily accessible, highly reactive trifluoromethylthiolating reagent, N-trifluoromethylthiosaccharin.8 The reagent can be efficiently synthesized from saccharin, a readily available, low-cost commodity reagent. N-Chlorosaccharin is prepared by treatment of saccharin with tert-butyl hypochlorite in methanol at room temperature for 5 min, while the second starting material AgSCF3 is prepared by the reaction of AgF with carbon disulfide under reflux at 80 °C. Reaction of N-chlorosaccharin with AgSCF3 in CH3CN within 30 min gives N-trifluoromethylthiosaccharin. N-Trifluoromethylthiosaccharin is an electrophilic trifluoromethyl-thiolating reagent that is more reactive than most of other reported electrophilic trifluoromethylthiolating reagents. N-Trifluoromethyl-thiosaccharin reacts with a variety of nucleophiles such as alcohols, amines, thiols, β-ketoesters, aldehydes, ketones, electron-rich arenes, and alkynes under mild reaction conditions (Scheme 1). The ease of preparation, stability toward air/moisture, and high reactivity with a broad range of substrates make N-trifluoromethylthiosaccharin an attractive trifluoromethylthiolating reagent for broad applications. Key Laboratory of Organofluorine Chemistry, Shanghai Institute of Organic Chemistry, Chinese Academy of Sciences, 345 Lingling Road, Shanghai 200032, China. E-mail: shenql@sioc.ac.cn. Financial support from National Basic Research Program of China (2012CB821600), National Natural Science Foundation of China (21625206, 21632009, 21372247, 21572258, 21572259, and 21421002) and the Strategic Priority Research Program of the Chinese Academy of Sciences (XDB20000000) are greatly appreciated. Mintz, M. J.; Walling, C. Org. Synth. 1969, 49, 9-10. Wu, H.; Xiao, Z.; Wu, J.; Guo, Y.; Xiao, J.-C.; Liu, C.; Chen, Q.-Y. Angew. Chem., Int. Ed. 2015, 54, 4070-4074. Leo, A.; Hansch, C.; Elkins, D. Chem. Rev. 1971, 71, 525-616. (a) Filler, R. Biomedical Aspects of Fluorine Chemistry; Kodansha: Tokyo, 1982. (b) Becker, A. Inventory of Industrial Fluoro-Biochemicals; Eyrolles: Paris, 1996. (c) Landelle, G.; Panossian, A.; Leroux, F. R. Curr. Top. Med. Chem. 2014, 14, 941-951. Boiko, V. N. Beilstein J. Org. Chem. 2010, 6, 880-921 and references cited therein. (a) Toulgoat, F.; Alazet, S.; Billard, T. Eur. J. Org. Chem. 2014, 2415-2430. (b) Ferry, A. L.; Billard, T.; Langlois, B. R.; Bacque, E. J. Org. Chem. 2008, 73, 9362-9365. (c) Ferry, A.; Billard, T.; Langlois, B. R.; Bacque, E. Angew. Chem., Int. Ed. 2009, 48, 8551-8555. (d) Ferry, A.; Billard, T.; Bacque, E.; Langlois, B. R. J. Fluorine Chem. 2012, 134, 160-163. (e) Baert, F.; Colomb, J.; Billard, T. Angew. Chem., Int. Ed. 2012, 51, 10382-10384. (f) Shao, X.-X. ; Wang, X.-Q. ; Yang, T.; Lu, L.; Shen, Q. Angew. Chem., Int. Ed. 2013, 52, 3457-3460. (g) Vinogradova, E. V.; Müller, P.; Buchwald, S. L. Angew. Chem., Int. Ed. 2014, 53, 3125-3128. (h) Shao, X.-X. ; Xu, C.-F.; Lu, L.; Shen, Q. J. Org. Chem. 2015, 80, 3012-3021. (i) Ma, B.-Q. ; Shao, X.-X. ; Shen, Q. J. Fluorine Chem. 2015, 171, 73-77. (j) Yang, Y. D.; Azuma, A.; Tokunaga, E.; Yamasaki, M.; Shiro, M.; Shibata, N. J. Am. Chem. Soc. 2013, 135, 8782-8785. (k) Munavalli, S.; Rohrbaugh, D. K.; Rossman, D. I.; Berg, F. J.; Wagner G. W.; Durst, H. D. Synth. Commun. 2000, 30, 2847-2854. (l) Bootwicha, T.; Liu, X.; Pluta, R.; Atodiresei, I.; Rueping, M. Angew. Chem., Int. Ed. 2013, 52, 12856-12859. (m) Pluta, R.; Nikolaienko, P.; Rueping, M. Angew. Chem., Int. Ed. 2014, 53, 1650-1653. (n) Kang, K.; Xu, C.; Shen Q. Org. Chem. Front. 2014, 1, 294-297. Xu, C.-F.; Ma, B.-Q. ; Shen, Q. Angew. Chem., Int. Ed. 2014, 53, 9316-9320. 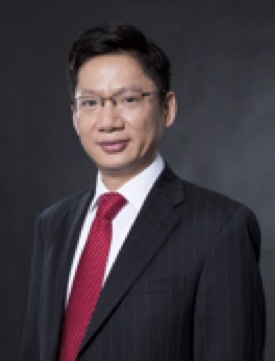 Jiansheng Zhu received his B. S. degree in pharmacy from China Pharmaceutical University in 2013. 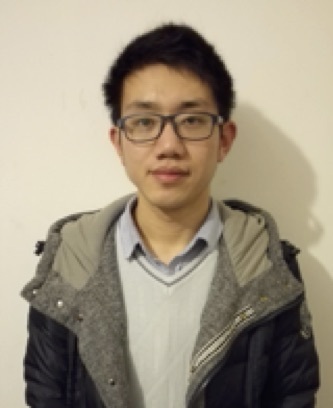 He is currently a third-year graduate student at Shanghai Institute of Organic Chemistry, Chinese Academy of Sciences under the supervision of Prof. Qilong Shen. His research interests focus on the development of new electrophilic reagents for trifluoromethyl-thiolation and difluoromethylation. Chunhui Xu received his bachelor degree in China University of Petroleum in 2015. 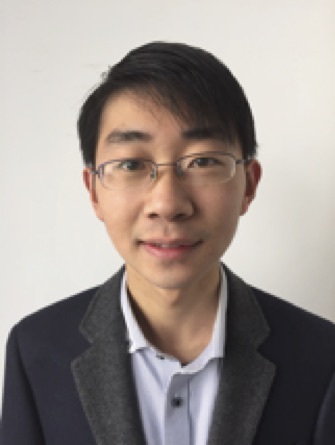 He is currently a research assistant at Shanghai Institute of Organic Chemistry, Chinese Academy of Sciences, under the supervision of Prof. Qilong Shen. His work is focus on the preparation of a variety of organic fluorine reagent and researching the preparation techniques. 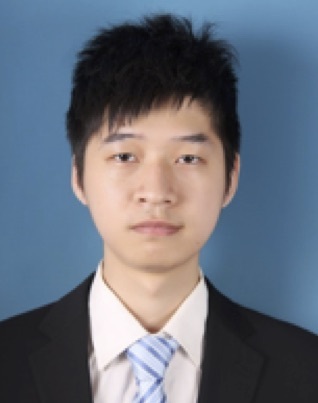 Chunfa Xu received his B. S. degree in Chemistry from Xiamen University in 2010. He became a graduate student at Shanghai Institute of Organic Chemistry, Chinese Academy of Sciences under the supervision of Prof. Qilong Shen and he received his Ph. D. degree in 2015. His research interests focused on the development of new electrophilic reagents for trifluoromethylthiolation and developing new methods for fluoroalkenylation. At present he is working in the NHU company in Zhejiang Province. Qilong Shen received his B. S. degree in Environmental Chemistry from Nanjing University in 1996, a M. S. in Organic Chemistry from Shanghai Institute of Organic Chemistry (SIOC), Chinese Academy of Sciences in 1999, a M. S. in Organic Chemistry from University of Massachusetts at Dartmouth in 2002, and a Ph.D. with Prof. John F. Hartwig from Yale University in 2007. After postdoctoral studies with Prof. Jeffrey S. Moore at University of Illinois at Urbana-Champaign, he returned to Shanghai Institute of Organic Chemistry (SIOC), to begin his independent career in 2010. Currently he is a full professor in the Key Laboratory of Organofluorine Chemistry. 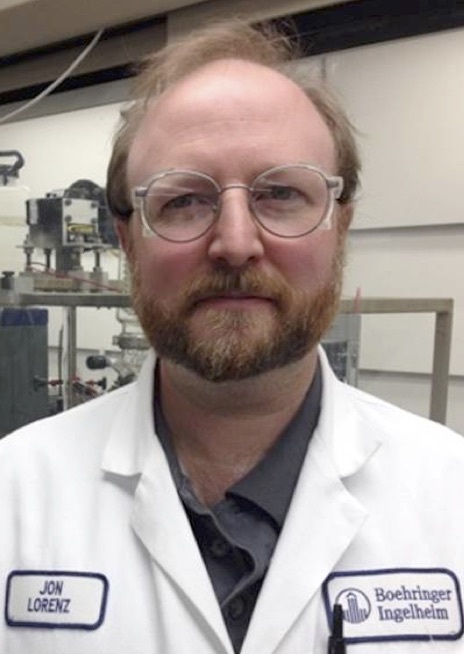 His research interests focuses on development of new reagents and methods for fluorination and fluoroalkylation as well as organometallic-fluorine chemistry. Jon C. Lorenz received a B.A. degree in Chemistry from Whitman College, Walla Walla, WA in 1995. He then joined the United States Peace Corps and taught science in the North West Province of Cameroon. Upon returning to the U.S. he began his graduate studies at Colorado State University, where he received a Ph.D. in organic chemistry under the guidance of Prof. Yian Shi in 2002. Subsequently, he joined the Department of Chemical Development at Boehringer Ingelheim Pharmaceuticals in Ridgefield, CT. In 2009 Jon moved to the Scale-up support group and then the kilo lab in Ridgefield, where he is currently a Senior Research Fellow. His research interests include the development and application of catalytic asymmetric reactions, use of Process Analytic Technology in Scale-up, continuous processing for scale-up, and the many facets of process development.